The Castle is situated in the heart of Tamworth town centre. From M1/M6 northbound take the M42 and exit at Junction 10. From the M6 southbound exit at Junction 12 and approach Tamworth via A5. The brown Tamworth Castle signs which you will see on the way into Tamworth will direct you to the Jolly Sailor car park. 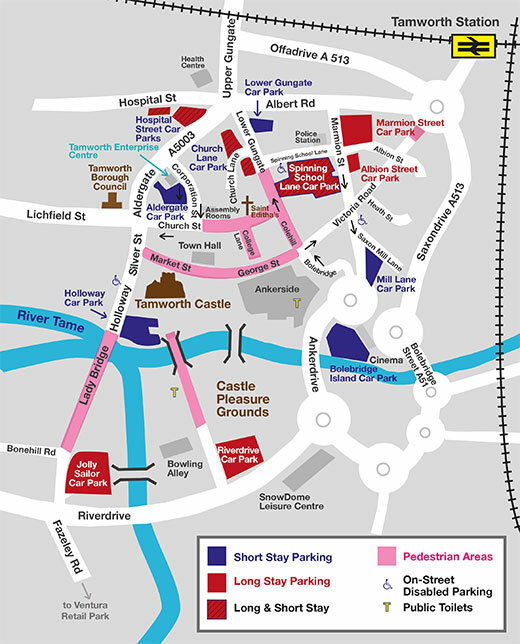 There are a number of car parks in Tamworth town centre. The brown Tamworth Castle signs direct drivers to the Jolly Sailor car park. This is a large long stay car park with coach park facilities. It is a short five to seven minute walk through the castle grounds. Ankerside Shopping Centre also provides a number of spaces along with many other town centre car parks. The short stay (2 hours) Holloway car park is a smaller car park but closer to the castle. It is located on Silver Street. Silver Street itself - which is on on the approach to the Castle - also has a small number of disabled car parking spaces. Please note all car parks which are run by Tamworth Borough Council offer free disabled car parking. If using a SatNav, please use postcode: B79 7NA. The Holloway car park is the closest but this can be very busy and is a short stay (2 hours max). The Jolly Sailor car park which is £1.50 per day and a five to seven minute walk from the Castle usually has plenty of space. Postcode: B78 3JJ. Please visit Arriva for details of bus services in and around Tamworth. The castle is in the heart of the town centre so you can't miss it! Please visit thetrainline.com. Tamworth Castle is brisk ten minute walk from Tamworth Railway Station. There is also a taxi rank at the station.